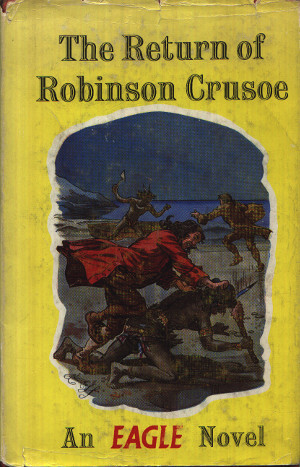 The Return of Robinson Crusoe. Retired as he thinks, to the life of a Yorkshire country squire, with the faithful Friday still with him, Crusoe one day receives a visit from a member of Henry Morgan's old pirate crew - the villainous yet likeable sea dog, Abel Juniper. Juniper has a proposition - and the map of a treasure hoard. Against his better judgement Crusoe is tempted to sail to adventure with him once more. Dimensions : 13.5cm x 23cm with 176 pages. Then, when the others set on him like a crowd of cowardly curs, the Indian took them one by one and threw them into the duck-pond by the inn fence. "He sounds interesting, Tashmaga," I said. "Let him come in to see me, and put your knife into a pocket where you can get to it quickly, if need be." "By salt pork and cutlasses!" he shouted, "but no other man had ever given Abel Juniper the refusal and gone on to reach old age!" "But Brother Tom," I said, "I am a magistrate, not a murderer." "I come to speak to Captain Crusoe," he said thickly, "and not a low dog of a ship's sawbones, by thunder and leg-irons!" In the centre of them burned a fire, surrounded by white stones, each one the size of a man's head. From that distance, these stones caused no qualms in my heart. It was only when we drew nearer and I saw what in reality they were that my courage failed me a little. They were skulls. "It is not the custom among such savages," he said wrily, "to end and affair like this too quickly. They may fast and dance for three days and nights before they finally put an end to us and eat us." "You are a fortunate man, Master," he said. "Few men live to say that they have stood on Yasha-Magu, the serpent, and have gone unharmed!" I will draw the cloak of forgetfulness over the next few seconds, for they are not pleasant ones to recall. "It is farewell, Master" he said simply. "I cannot come with you."